Wall Street scandals. Fights over taxes. Racial resentments. A Lakers-Celtics championship. "The Karate Kid" topping the box-office charts. Bon Jovi touring the country. These words could describe our current moment or the vaunted iconography of three decades past. In this wide-ranging and wickedly entertaining book, "New York Times" bestselling journalist David Sirota takes readers on a rollicking DeLorean ride back in time to reveal how so many of our present-day conflicts are rooted in the larger-than-life pop culture of the 1980s from the Greed is good ethos of Gordon Gekko (and Bernie Madoff) to the Make my day foreign policy of Ronald Reagan (and George W. Bush) to the transcendence of Cliff Huxtable (and Barack Obama). Today's mindless militarism and hypernarcissism, Sirota argues, first became the norm when an 80s generation weaned on Rambo one-liners and Just Do It exhortations embraced a new religion with comic books, cartoons, sneaker commercials, videogames, and even children's toys serving as the key instruments of cultural indoctrination. Meanwhile, in productions such as "Back to the Future, Family Ties, " and "The Big Chill," a campaign was launched to reimagine the 1950s as America's lost golden age and vilify the 1960s as the source of all our troubles. That 1980s revisionism, Sirota shows, still rages today, with Barack Obama cast as the 60s hippie being assailed by Alex P. Keaton esque Republicans who long for a return to Eisenhower-era conservatism. The past is never dead, William Faulkner wrote. It's not even past. The 1980s even more so. 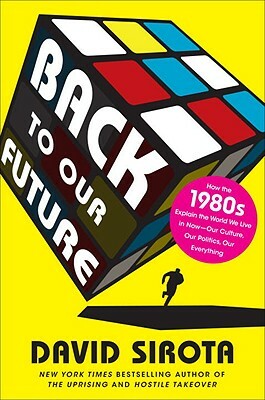 With the native dexterity only a child of the Atari Age could possess, David Sirota twists and turns this multicolored Rubik's Cube of a decade, exposing it as a warning for our own troubled present and possible future. David Sirota is a journalist, nationally syndicated weekly newspaper columnist, and radio host. His weekly column is based at" The Denver Post, San Francisco Chronicle, " Portland "Oregonian," and "The Seattle Times" and now appears in newspapers with a combined daily circulation of more than 1.6 million readers. He has contributed to "The New York Times Magazine" and "The Nation" and hosts an award-winning daily talk show on Denver s Clear Channel affiliate, KKZN-AM760. He is a senior editor at "In These Times" magazine and a Huffington Post contributor and appears periodically on CNN, "The Colbert Report, " PBS, and NPR. He received a degree in journalism and political science from Northwestern University s Medill School of Journalism. He lives in Denver with his wife, Emily, and their dog, Monty."